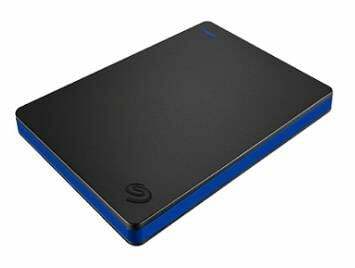 Seagate has launched an external disk drive for the PlayStation 4 so gamers can cram more gear into their consoles. Coming in 1TB, 2TB or 4TB variants, the drive attaches to the PS4 via a USB 3.0 cable. The Playstation 4 has a 500GB internal hard drive and read-only optical drive. Seagate said games can take up 40GB each and - as any fan will know - just a few can max out PS4 disk storage. A 2TB version of Seagate's Game Drive could hold 50 such games, the vendor claimed. Seagate also said the USB 3.0 link was as fast as the PS4's internal drive and claimed gaming responses wouldn't be throttled. There are some 92 million PS4s in the sweaty palms of customers, so Seagate's upgrade market looks pretty good at first glance. It's a fairly crowded market, and the storage firm has tried to set its kit apart by gaining Sony licensing for the gear. However, Sony has pointed out that PS4's lack of internal drive space could also be sorted using a so-called Extended Storage Device – ie, any old external storage with a USB 3.0 connection – although it has to be formatted for PS4 use. Capacities of up to 8TB are supported. Jelly Deals suggests a Samsung SSD T5 as the fastest ESD device, along with various Seagate, Toshiba and Western Digital drives.